With its many hills, mysterious woodland, wild moors and burbling rivers the Peak District is a dog’s paradise; and it’s not a bad place for a dog owner to explore either. These geographical aspects, together with myriad dog-friendly holiday cottages to stay in and pubs to eat at, make the Peak District a smashing holiday destination for dog owners and their loyal companions. If you are considering a break in the Peaks this summer, the sheer number of places to visit and great walking trails to explore might make it difficult to decide which part to choose. So, to get you started we have pick three of our favourite dog-friendly areas to visit that provide fantastic walks. Located in the heart of the Peak District park is the village Hathersage. This is the perfect base for those who want to combine exploring the Peak’s literary past with long walks. Hathersage was not only the inspiration behind several of the locations in Charlotte Brontë’s novel Jane Eyre, but legend has it that it also has strong connections with Robin Hood. If you’re based in or near to Hathersage head to St Michael’s church where one of the most famous of Robin Hood’s merry men, Little John, is said to be buried. According to legend, Robin Hood also has roots in the area and was born only 8 miles away in Loxley. Venturing out of the village and into the surrounding countryside you will find many intriguing connections to the legend with places like Robin Hood Cave north of the village. If you head west of Hathersage you will pass Robin Hood’s Stoop at Offerton Moor and Robin Hood’s Cross on the nearby Abney Moor, be aware however that on sections of the moors, dogs are only allowed on the public rights of way and you should remain vigilant about the livestock. Charlotte Brontë visited Hathersage in 1845 and when writing Jane Eyre she choose to base the village Norton on it, as well as using the surname of the leading local family of the time, the Eyres, for the surname of her heroine. Head 3km out of Hathersage and you will come across North Lees Hall, an Elizabethan house said to be the inspiration for Thornfield Hall in the novel. 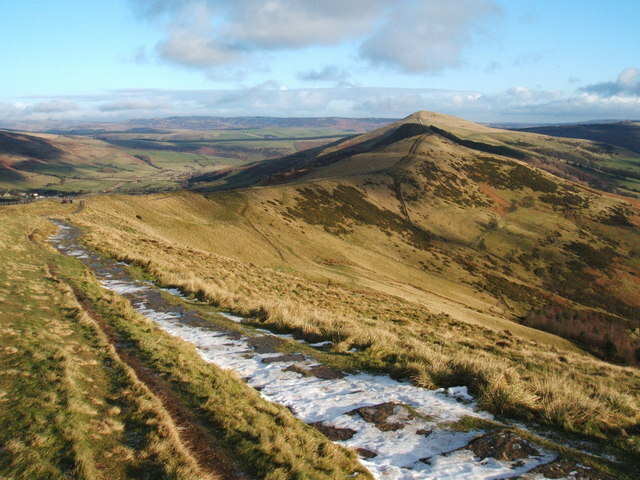 The Peak District has a split personality: the White Peak in the south and the Dark Peak in the north. The Dark Peak is the wilder, less inhabited part of the Peaks and it also has some of the best walks this National Park has to offer, including those your dog might enjoy the most. 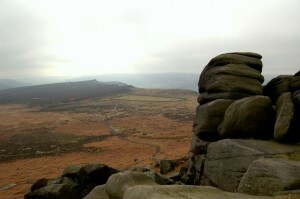 The Edale Valley is a great place to base yourself if you want to explore the Dark Peaks. Edale is surrounded by hills which not only provide excellent walking trails but also some great views over the landscape. There are numerous walks that can be tackled within a day, however some can be quite challenging, and you can expect to find a range of terrain from woods to moors. Head north of Edale to explore the popular hiking territory Kinder Scout, while there are also popular walking routes to the west and east to discover as well. If you are looking to take your dog on a longer walk you can choose to tackle part of the Pennine Way, which starts at Edale Valley. This National Trail covers 268 miles along the Pennine Mountain tops and heads north through the Yorkshire Moors and ends beyond Hadrian’s Wall. 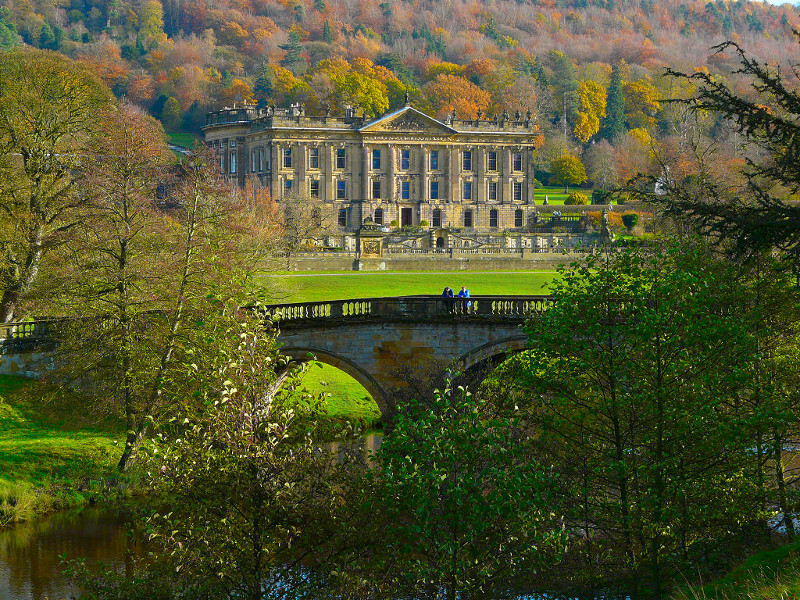 The Peak District is home to some of Britain’s most famous stately homes, most notably Chatsworth House. This stunning country house has been used as the backdrop for numerous Hollywood films and television series. 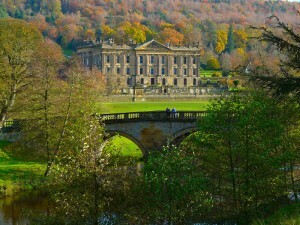 If you fancy a more sedate stroll with your dog, then the Chatsworth grounds offer up ample territory. If you are based in or near the village of Rowsley you are within easy walking distance of Chatsworth House. The walk will take you across fields, over scenic bridges and through small woodland areas. Once at Chatsworth House you can explore its 105 acre garden that includes permanent sculpture displays and a renowned waterworks, including a 300-year-old Cascade, the trough waterfall and an enormous gravity-fed Emperor fountain. As well as this there is a 1000 acre park to explore that includes a large woodland area that provides great views of the house and gardens. Dogs are welcome in both the gardens and park, but must be kept on a lead. Enjoy! This entry was posted in Dog Friendly Holidays and tagged accommodation, animal, dog, dog friendly, The Peak District by admin. Bookmark the permalink.